We now have our own Nursery provision where children aged three attend afternoon nursery daily. 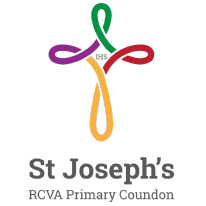 This will ease transition prior to starting school here at St. Joseph’s RCVA. We also visit other Nursery Schools to meet all the children and speak to class teachers. We complete home visits which enables parents to speak to us regarding their individual child’s needs. All children are offered an opportunity to visit their new class. We also offer additional school visits for children with SEND to enable a smooth transition. Upon entry into school children are gradually introduced with an informal timetable working up to a full working week by week 3. As the children progress through each year group, they spend two days of transition with their new classes in July prior to starting in September. The transition days in July tie in with Y6 transition to the local secondary schools. As the children progress into new classes/ schools, information is shared with colleagues and where appropriate, new training is given to staff. Key information regarding any SEN/ attainment etc is recorded and filed for the children, and this paperwork travels with them in their school life and into each new setting.